If you have been watching us for a while you will probably know that the Machine 3D is the third incarnation of the Lush “Machine” deck. The Machine was born in 2011 from us wanting to shape a setup that could handle high speeds, ollie well and still be good as a cruiser board. 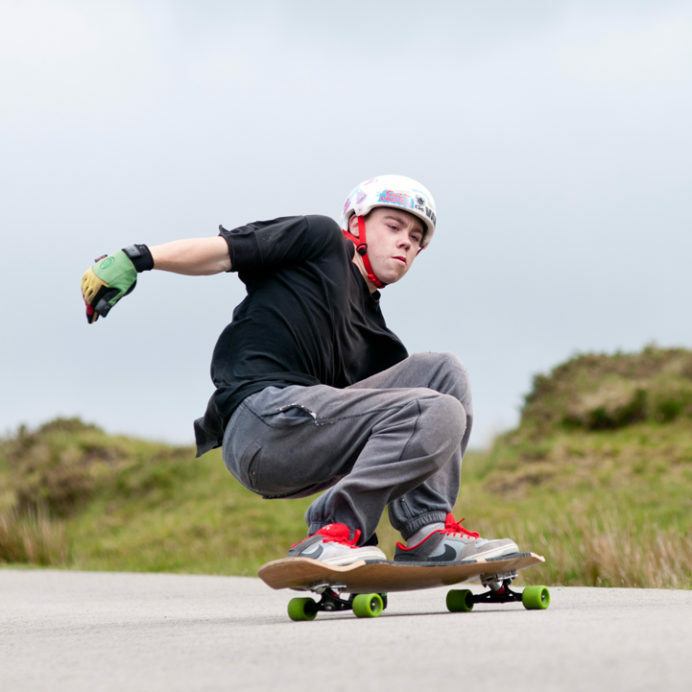 Although there are a lot of longboard decks in the “speedboard with a tail” category, a lot of them have tails that are too short, in the wrong place, or just not steep enough. 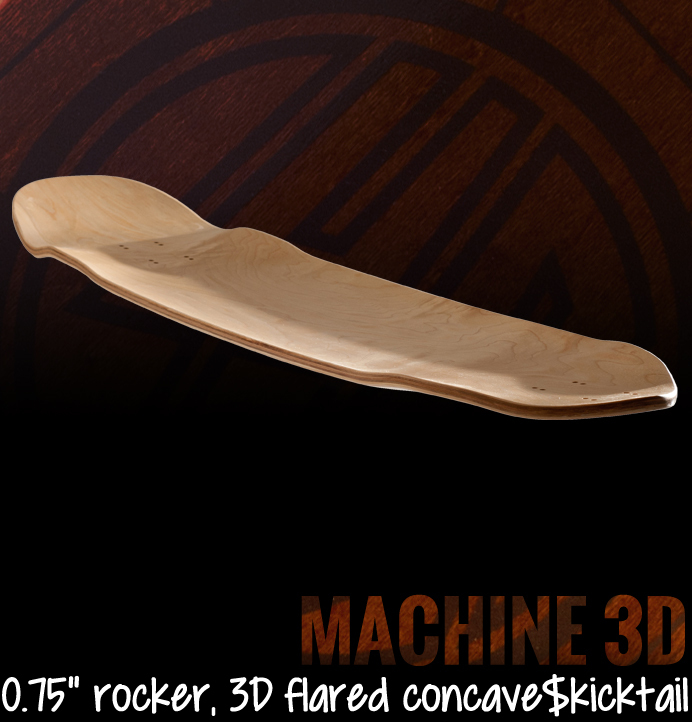 A steep, solid tail with some rocker in the mix gave us the Machine and later than Machine 80’s, and for 2016 we have added 3D wheel flares, a bit more rocker, and a refined, simpler shape to produce the Machine 3D. 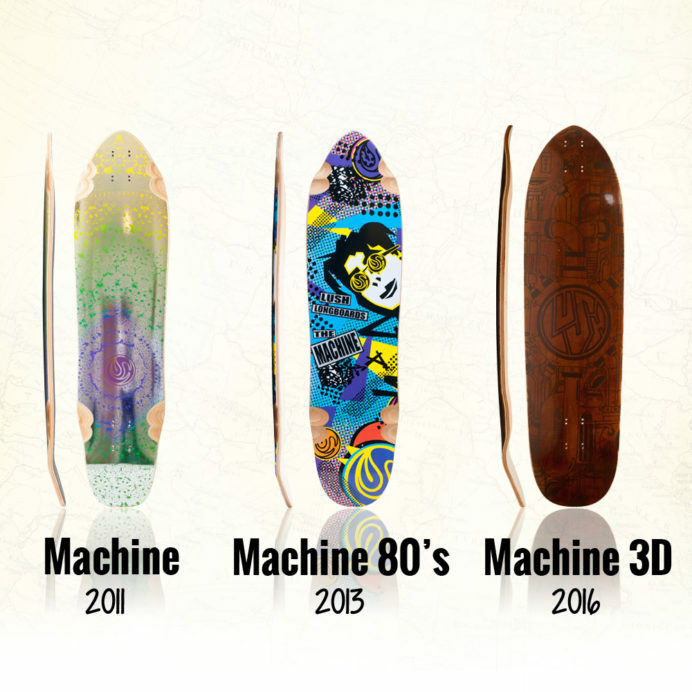 Like all our decks, the Machine 3D has come from many hours of shaping, skating, reshaping and skating some more until we have a deck we are happy with. 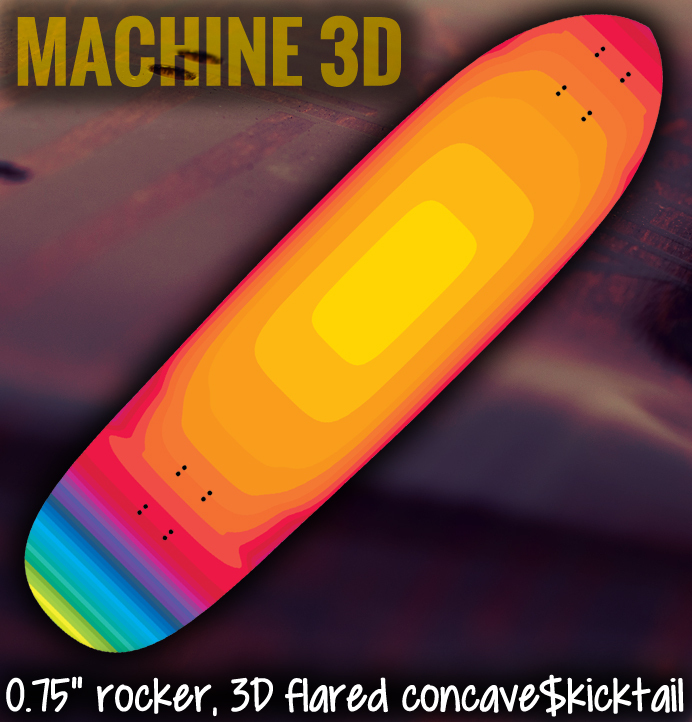 Usually Team Riders are heavily involved in this process, and the Machine 3D is no exception. Lush UK teamrider Josh “Jooz” Hughes loved the original shape, and as soon as we started pressing 3D Rocker concave into our decks he was hassling us for an updated Machine. This deck has really come from his skating – speed, freeride, big fast slides, and downhill ollies. Jooz hitting an early “square nose” prototype of this deck back in 2013. The Machine 3D is shaped around a medium length freeride wheelbase, adjustable from 24.5″ to 25.3″. It’s pretty wide at 10,” as Jooz wanted more width then previous versions to keep his feet locked in for those high-speed powerslides. We’ve increased the length slightly to a do-it-all 38.5″ – this thing will stash in your locker, strap to your motorbike, or hide under your desk but still has enough length to hit some hills. We have used an 8ply 100% Canadian Maple layup for the perfect balance of light weight, strength and a stiff flex. The 3D Rocker is a little deeper than previous Machines, simultaneously allowing extra wheel clearance and giving you some nice flairs in to find your perfect foot position. The Concavoscope ™ view of the Machine 3D shows you what your feet can expect… a solid platform with lots of reference points. You can buy the Machine 3D as a deck or complete direct from us in the UK, or from your nearest Lush Longboards Stockist everywhere else. Check out an overview of this deck at Longboard Magazine Europe!